The DJI S900 test drone by ComEd is held aloft by six electric motors attached to 38-centimetre propellers. The drone can fly a maximum of 18 minutes per charge. A giant power utility and unmanned aerial systems (UAS) – better known as drones – may seem like an unlikely combination, but Illinois-based Commonwealth Edison (ComEd) hopes to change that. The utility, which has 3.8 million customers across northern Illinois, operates a distribution network that includes nearly 145,000 kilometres of power lines and more than 32,000 underground vaults. In addition to sending workers in on foot, ComEd uses helicopters to inspect some transmission lines and substations. But that could change if the company’s first drone, developed in collaboration with the Illinois Institute of Technology (IIT), performs as hoped in a test that started this summer. ComEd decided to explore the issue further, which led to the collaboration with IIT. The US Federal Aviation Administration signed off on the plan in February, making ComEd the first utility in the country to win approval for drone use as part of its ongoing operations. ComEd’s test drone is an off-the-shelf model called the DJI S900, which is held aloft by six electric motors attached to 38-centimetre propellers. According to DJI’s website, the S900 weighs in at 3.3 kilograms and boasts a maximum takeoff weight of 8.2 kilograms, meaning you can load an additional 4.9 kilos of gear aboard. For ComEd, the focus will be on imaging. With a network as big as ComEd’s, flight time is also a huge concern. DJI’s website says the S900 has a maximum flight time of 18 minutes per charge. “All of these rotocraft are fairly inefficient because you’re spending a lot of energy just hovering in the air,” says Dr. Matthew Spenko, IIT associate professor of mechanical and aerospace engineering. One modification they’ll be testing is the addition of a lightweight cage, allowing the drone to roll as well as fly. “Our hope is that this would allow a much greater operating time when used out in the field,” says Spenko. 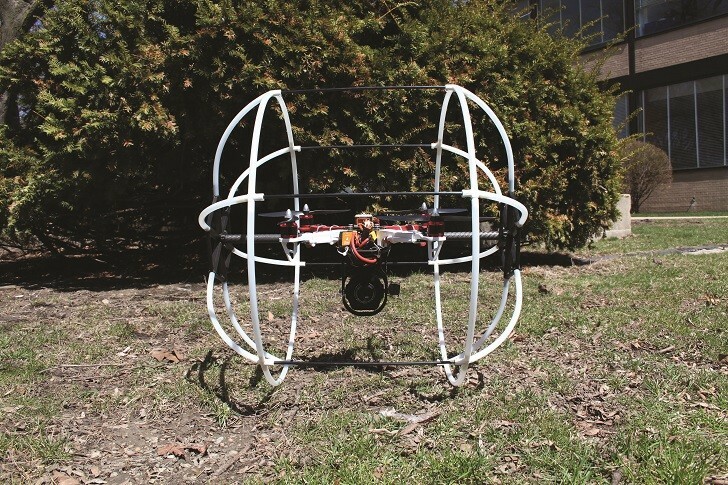 ComEd’s drone ambitions don’t stop with the skies – it aims to send robots into its underground network, too. This program is still in the early stages – basics such as a propulsion system haven’t been worked out yet – but ComEd hopes to collect data from below city streets before workers head down, giving them a better lay of the land and tipping them off to anything that may be a safety risk. “Right now the worker goes into the manhole and uses a handheld digital [thermographic] camera to detect hotspots and latent defects that could be a safety hazard,” says Donnelly. “So when we look ahead to underground robotics, we’re thinking in terms of seeing thermographic imagery and also perhaps imagery that can help with the mapping of the assets in the manhole. Geospatial-type information in terms of records and cable identification could also be useful,” he adds. As with the UAS program, ComEd is teaming up with another organization to help develop its underground drones – in this case the National Electric Energy Testing, Research and Applications Center (NEETRAC) at Georgia Tech University. Donnelly sees partnerships like these as crucial to tapping into the expertise needed to make the most of new innovations like drones.